I follow a lot of runners on Instagram and they all mention how great a running partner is. Thing is, I am too slow to run with anybody. I once tried to join the local running group and they told me they didn’t have anyone that did slower than a 10-minute mile but they would give me a map I could follow–gee thanks. I can make my own route…I was interested in running with somebody. Then, for a short time I could run with Caitlyn, but she is faster than me and trying to get her to run is very difficult. I gave up on running with anybody and just ran for myself, but I was kind of bummed out. Then this little dude came along. His legs are long enough to run with me but not so long that he’s dragging me. I have started taking him with me more often. The other day I tried to sneak out without him and he was having nothing of it. He now gets excited just seeing me in my running clothes. He does 4 miles easily, though by the end he is slowing down. I don’t know how much further he can go–I might have to sneak out for my longer runs, but for now, I am really excited to have a running buddy. Hubby still sometimes makes the silly mistake of thinking he is the girls’ dog. Nope, he is mine, all mine. 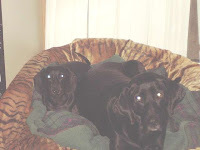 My hubby and I both had dogs before we met each other, His and her dogs. 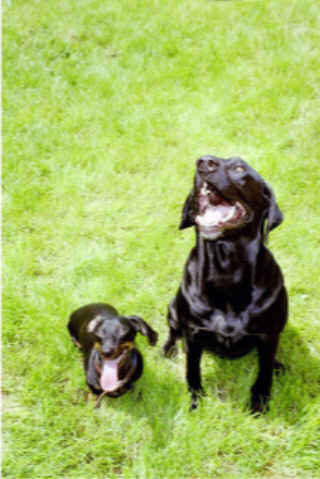 He is black lab Misty and my doxie Stuie. They were our friends and companions. Stuie (who’s full name is Stuart Little, Mommy’s Dackal) was my baby. At the time I was very, very sick due to Multiple Sclerosis. I never thought I would find someone willing to date me and marry me, and if that did happen, I thought I was too sick to have kids, so Stuie was my baby. And my hubby had his Mistydog. Truth be told, she was a good teacher for Stuie. She was quite well trained. Fast forward a few years. We got married and now have two little girls, with baby 3 coming very soon (89 days til due date if you were wondering!). Recently, Misty started to lose weight and hair, so I took her to the vet. Turns out she had a liver issue. While hubby and I talked and prayed over the next week about how much to do about/for Misty, she went really down hill, really fast. 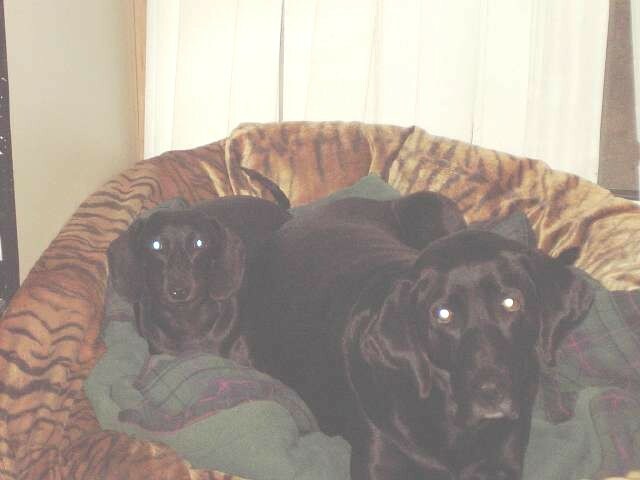 Just one week after taking her to the vet it became apparent our dog was really sick and would be leaving us soon. So Monday hubby took her in to the vet. She was so sick and so miserable. There was no doubt. I was shocked at how hard it was to know she would not be here when I came home from work. To add to the agony, over the weekend Sue and Caitlyn decided they adored Misty. Sue claimed her as her own. Great timing, huh? Daddy got the task of explaining it to the girls. Misty was old, died and went to doggie heaven. I have gotten to explain it several more times today, with Caitlyn declaring “I miss Misty, mommy.” So do I my little girl, more than I ever dreamed I would. Stuie is cashing in a little bit. He is getting a lot more attention and time with all of us. But I think right now he is a little confused and, if possible, a little sad too. My mother-in-law said it best though, “we sure open ourselves up to a lot of hurt when we open ourselves up to love with a pet. But would we have it any other way?” No, pets are part of our life. They are part of what makes our family, our family…whether it is one of our 3 fishes or our doggies. We love them and now one, we miss. But boy the table scraps are probably pretty awesome in doggie heaven.